Fans of the Merseyside electrics may be interested to know that the Suburban Electric Railway Association in Coventry are planning a cosmetic restoration of their preserved Wirral Line Class 503 unit. 2013 marks the 75th anniversary of the introduction of the Class 503 units and the commencement of the electrified services on the Wirral Peninsula between Birkenhead and West Kirby and New Brighton. In order to mark this important event, SERA plan to launch the restoration of the last surviving Wirral EMU and have the vehicles returned to their former glory in a display condition in time for the unit’s 80th anniversary in 2018. The 503s are often considered a “sister” class to the 502s, although they are of a different design. 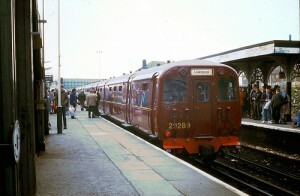 The 503s briefly worked alongside 502s in the late 1970s, when some Wirral units were temporarily transferred to the Northern Line. For more information please see SERA’s web site.